The deadlift is a strength-building exercise that is a staple of powerlifters and other athletes looking to get stronger. 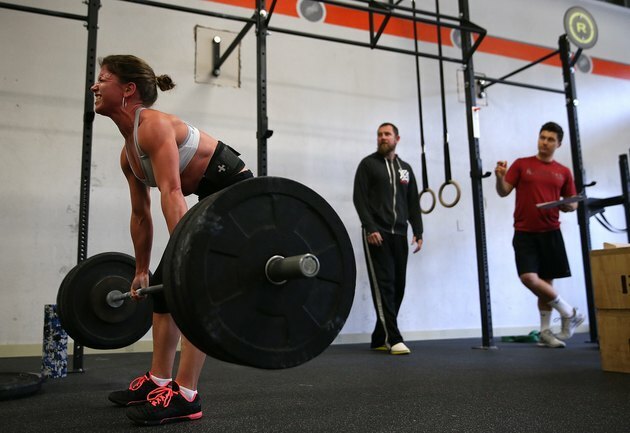 The deadlift is typically performed with a barbell and heavy weight, giving it the potential to cause back strain or muscle tears if not performed correctly. Consult with your doctor or physiotherapist before trying the deadlift if you've had any prior back problems. The deadlift is a lifting exercise that begins with your feet a little closer than shoulder width, underneath the barbell. Bend down to grasp the bar with an overhand grip, or one over and one under. Keep your hands about shoulder-width apart. Stand straight up, keeping your arms and back straight throughout the movement. As you pull and lift the bar, keep it close to your body and avoid swinging the bar away from your body to gain momentum. Pause at the top for a moment, then lower the weight the same way and repeat. Your lower back is most at risk when performing the deadlift. The exercise is often made unsafe by the lifter rounding his back and bending over too far at the hips just before lifting. Holding the bar away from your body instead of right against it is another way to injure your back. At the top of the movement, avoid hyperextending your lower back. Some people lean back a little at the top, but doing so only asks for trouble. Taking measures to prevent a back injury in the first place will make your deadlifting sessions more productive and enjoyable. Keep your chest up and look forward as you lift the bar, to ensure your back remains straight. Also, keep your knees and toes pointed in the same direction so your base isn't weakened when you hoist the weight up. Consider using weightlifting wrist straps for additional support. Squeeze your glutes hard at the top of the movement to help support your low back and keep it from arching backward. The deadlift works the erector spinae muscles along your spine, as well as several others in your upper and lower body. Your glutes, hamstrings, quadriceps, trapezius and even your abdominals are used when performing the deadlift. Perform complementary exercises to keep these muscles strong and you will avoid putting too much stress on your back during the lift.